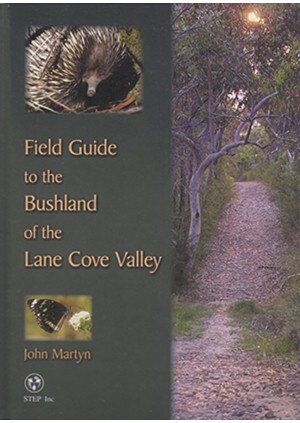 The Field Guide gives a natural history overview of the whole of the Lane Cove catchment. There are chapters on geology, landscape, flora, fauna and the effect of human impact. There are also detailed descriptions of the bushland reserves as a series of cameo descriptions, usually in the form of guided bushwalks. The lengthy database of plant and animal records is for research into status and changes in biodiversity. It is followed by a full index. It is designed to educate, and also to show that you don’t need to go out and buy a wilderness calendar to glimpse the beauty of the natural world. Just take a walk in your local bushland. It is full of colour photos of the beautiful trees, ferns, flowers, animals and waterfalls that abound in our own local bushland. And the pictures are not just to beautify the book and win converts to the natural world, but to inform, record and assist the reader in identifying those plants and animals. John Martyn was born in Cornwall and came to Australia in 1970 after mapping in the Rift Valley of Kenya for his PhD in geology. Although he has lived in Sydney since 1979, much of his fieldwork as a minerals exploration geologist over the last 30 years has been in Western Australia. His first experience of spring in the West Australian goldfields left him stunned by the colour and variety of flowers in the bush. It was the beginning of a lifetime enthusiasm for Australia’s flora and fauna. Moving to Sydney, John was amazed by the beauty and variety of landscape and habitats around the city’s suburbs. He has been exploring, mapping and photographing Sydney’s natural world ever since. John has also coordinated our walks and talks programs, with himself leading several very informative and eye-opening walks. In recent years, John has chosen wide-ranging landscapes such as Deep Creek at North Narrabeen, Kurnell and Botany Bay National Park, Dog Pound Creek and the Hornsby Diatreme, Ku-ring-gai Chase National Park at West Head, Cumberland State Forest and Bents Basin. The popularity of his walks for STEP has led John to host walks for Hornsby Shire Council.